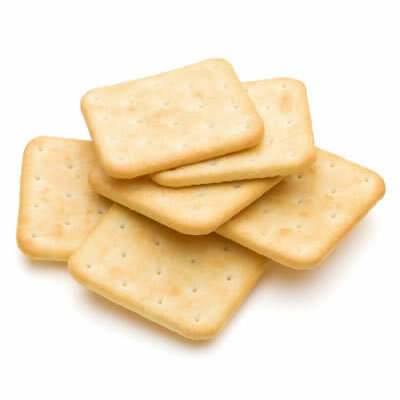 Sodium bisulfite helps to break down the gluten matrix in crackers, thus relaxing the dough. Molecular structure of sodium bisulfite. When suspended in water, bisulfite anions generate a sulfurous acid. The sulfurous acid subsequently reacts with the cysteine amino acids, creating S-sulfocystein residues within the protein structure. These residues inhibit the restoration of disulfide bonds. Essentially, sodium disulfite acts as a cap, covering the reactive thiol group on cysteine so it is unavailable to reform a disulfide bond.1 These actions result in a very relaxed and pliable dough, eliminating chances of it tearing as it passes through the reduction rollers. In baking applications, sodium bisulfite is commonly used as a reducing agent to break down the gluten matrix in breads or snack crackers, consequently relaxing the dough. In fruit-filled pastries or donuts, its oxidation inhibiting capabilities prevents browning. It is a significant source of vitamin B1 when utilized as an additive in food. Fort, Emily L. “Effect of Reducing Agents on Batter Consistency and Physical Characteristics of Bread from Sorghum Flour.” Kansas State University Master Thesis (2016): 17-18. Kisielewski, James, and Don Robertson. “Patent US7985396 – Process for Production of Sodium Bisulfite.” Google Patents. Google, 26 July 2011. www.google.com/patents/US7985396. Accessed 16 June 2017. “CFR – Code of Federal Regulations Title 21CFR182.3739.” Accessdata.fda.gov. 1 Apr. 2016. www.accessdata.fda.gov/scripts/cdrh/cfdocs/cfcfr/CFRSearch.cfm?fr=182.3739. Accessed 16 June 2017.